This is a presentation that Eric Dollard has wanted to deliver for the last couple years. It was inspired by his discovery that on the land where the seismic lines are, there is an enormous amount of electrical transmission interference. Upon further research, Eric discovered that it is caused by the degenerated manner in which the grid is wired, which has deviated from the good practices of the past. This presentation is 5 hours long so not for the faint of heart! 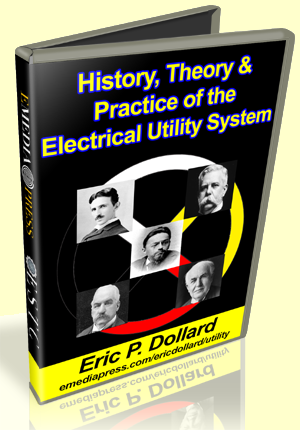 It is laid out in several sections sequentially starting with the most comprehensive history of electrical utility transmission systems, comparison between AC & DC, the development of the lighting systems, wiring methods, and related topics. It also lays out who the main players are, who got it all started and who inspired the modern electrical age as we have it. Eric Dollard covers in detail all the different transformer wiring methods including Delta and Y (Wye) Three-Phase and many variations of each. He is very clear about what methods are preferred and what is wrong with the non-preferred methods that are already in widespread use. He covers the distinctions of why power engineers think the poor methods they are using are better, which reveals the fact that they don’t know what they don’t know – this is where the trouble begins. One of the most important elements of this entire presentation is that EMP (electro magnetic pulse) vulnerabilities from nuclear weapons detonated in the atmosphere or other sources of EMP is a very hot topic. What is even hotter that most people don’t recognize is that as the grid is degenerated (and at a higher cost), not only is the grid vulnerable to the damage, the way the grid has been connected actually turns it into an antenna to broadcast the EMP damage right into YOUR home! Every appliance plugged into the grid is metallically connected to HOT electrical wiring right at the electrical utility pole. The notion that everything is grounded to protect from this kind of situation is faulty and you will learn why. Has this been done intentionally or is the sabotage simply unknown to the engineers and was made possible simply by their own ignorance of the matter? Is this sabotage organized top down by those who wish to take down the United States? Whatever the case may be – if you don’t believe in conspiracy theories yet, you probably will. Intentional or not, this is something that needs to be addressed and is so important that it should be a National Security concern with high priority.